HollyShorts Film Festival welcomes Pacific Northwest Alliance! Award Winning Seattle Filmmakers set to showcase films at the 2016 LA Hollyshorts Film Festival! Seattle, WA — Media Inc has partnered with Hollyshorts Film Festival as their official press affiliate this year covering the events from the iconic TCL Theater and the Roosevelt Hotel on Hollywood Boulevard Aug 11-20. HollyShorts Film Festival announced last week the 3rd annual inclusion of the “WA State Film Showcase” for their line-up of special film short screenings. Hosted at the iconic Grauman’s Chinese Theater on Hollywood Boulevard and other LA venues (The Roosevelt Hotel, Harmony Gold Theater, OHM Nighclub, Ignited Spaces, Avenue 17 Studios, 33 Taps and Redbury Hollywood), the 12th annual Hollyshorts Film Festival will be featuring works from 400+Indie Film shorts from around the world during a week long odyssey between Aug 11-20 packed with of screenings, conferences, parties, panels, workshops and special events. Nearly 3000 films from every continent were submitted this year. 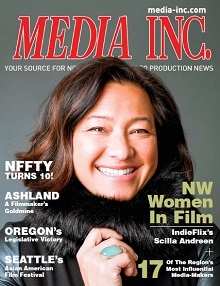 Pacific NW production companies Evil Slave (ES), Abundant Productions (AP), Mighty Tripod Productions (MTP), Modern Motion (MM) and Capestany Films (CF) will be featuring works from PNW Filmmakers. Headlining the showcase will be the World Premier of 2015 Award Winning Hollyshorts screenplay “The Lunchbox Brigade”. Produced collectively by Lorraine Montez, Ben Andrews, David S. Hogan, Marissa Fujimoto, Ryan Wagenhauser and Christopher Meuer, this warm and adventurous coming of age tale featured over WA state with a cast and crew filmed entirely in the Evergreen State. The Lunchbox Brigade follows a neighborhood squadron of kids that discovers their brother-in-arms, Johnny, has gone to camp for the summer. They determine a rescue is in order, and together they embark on an antic-filled plan to infiltrate enemy territory (aka summer camp) and free their friend. But when their leader, Teddy, discovers that Johnny actually wants to be at camp, he must lead the Lunchbox Brigade in a touching tribute to the loss of one of theirown. Casted by David S. Hogan of Mighty Tripod Productions, the local talent included Kyan Zielinski as Teddy, Forrest Campbell as Bugsy, Malakai James as Logan, Kristoffer Holtan as Clyde, Eden Campbell as Sue and Alex Silva as Johnny. “I had a great time casting the talent for this great film. The amount of talent we saw during the auditions was very impressive. The kids that were ultimately cast are some of the region’s best young performers I’ve seen,” said Hogan. Hollyshorts is listed by MovieMaker Magazine as one of the “top 25 festivals worth the entry fee,” HollyShorts awards the winner of the screenplay competition with an automatic entry in the following year’s festival. Capestany’s latest film “Across The Pond” starring University of Washington alum and now Hollywood writer/producer/actor PARIS DYLAN, was selected to screen during this years WA Film showcase. “It was an honor and privilege to have worked with such a great team on this film. Pulp Digital Productions really pulled out all the stops and delivered an impressive film. Rene (Bourke) really worked hard leading us all for over a year to make this film come to reality,” Dylan said. “I’m so proud of our amazing team, Pulp Digital Productions, Paris Dylan, and special mention to Capestany Films for their consulting, guidance, and marketing expertise to see this film through to showcased in the worlds entertainment capital of Hollywood at this prestigious Hollyshorts Film Festival.” Said Executive Producer and lead actress Renee Bourke. Also supporting the 2016 Hollyshorts Alliance are industry leaders Terri Morgan of TCM MODELS and Peter Barnes of CLATTER & DIN, Inc.
“I’m honored to be the winner of the 2015 Screenplay competition with HollyShorts and am impressed with the professional caliber of the Pacific Northwest filmmakers producing the short,” said Thiele, writer and director of The LunchBox Brigade.